As D&R Vacuum & Appliance World nears 60 years old, owner and founder Bob Regier looks back with pride on the business he built from the ground. Regier was looking for work when he came to Windsor in the early 1950s from the family farm in Zurich, Ontario. His uncle, the local manager of the Air Way Vacuum Company, brought him into the business as a service and salesman. For three years he sold Vacuums and repaired them. It was the kind of work that grew on him, so when the opportunity arose to purchase the Air Way franchise he seized it. Bob opened a shop on Pillette Road in east, Windsor. After a year, he opened D&R Vacuum. As the business grew, so did the need for more space. The business moved to Ottawa Street. 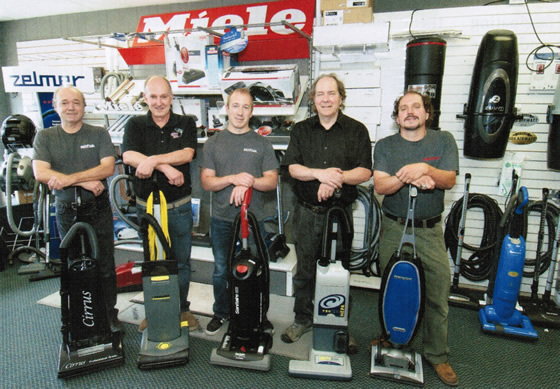 With the extra floor space and storage, Regier was able to carry an expanded variety of vacuum cleaners. As well he added sewing machines to the D&R repertoire. Today our customers can even participate in lessons offered by D&R sewing expert staff. The business on Ottawa Street and Wyandotte are owned and operated by Chuck and Bob JR and employed are Gary and Ken "Brothers" John "Chuck's Son" and his Son Joshua all working as a team. D&R Vacuum and Appliance World is an independent store, not affiliated with any others. We continue to offer the quality products and service that the business has built its reputation on. We carry 100's products, not just vacuum cleaners. However vacuum cleaners continue to be the mainstay of the business. Whether you are looking for an upright, a canister or a built-in model at D&R Vacuum you can find all the major brands including Miele, Dyson, Oreck, Eureka, Filter Queen, Panasonic, Kenmore, Royal, Centaur, Hoover and Kirby. Again we love to stress that service is provided for our brands. We are one of the few dealers who service everything that we sell! Supplying quality products a full line of accessories and being capable of servicing and repairing the products all add up to the superior customer service D&R Vacuum & Appliance World is known for.